I really looove being pet. I will stop in my place once you start and won't budge. I'm a really cute little dwarf boy. Please meet me soon! If you are interested in me as a friend for your single rabbit, please bring him/her to the shelter any Saturday or Sunday between noon-5pm to have a "bunny dating" bonding session with me! I am waiting for you at the Oakland Animal Shelter, so no need to email or anything if you want to meet me, just come on down and visit! I am already neutered, so I could go home with you the same day. You can find directions and hours on our website. 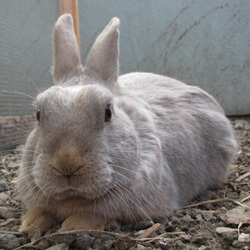 The adoption fee for a rabbit at Oakland Animal Shelter is $35.